Almost 400 athletes turned out for the ECMP 2018 European Biathle-Triathle Championships in Weiden (GER) from July 27-29. A total of 389 athletes competed, hailing from 17 countries (Germany, Italy, Portugal, Belarus, Russia, Ukraine, Monaco, Spain, France, Great Britain, Latvia, Austria, Hungary, Bulgaria, Lithuania, Czech Republic and, making a guest appearance from Asia, Japan). After the opening ceremony on July 27, the Triathle was held on July 28 and the Biathle on July 29, each comprising individual events for men and women and a Mixed Relay. Results are available here. A spokesperson for the local organizing committee said: “It was great to welcome so many competitors to the European Championships and our volunteers rose to the challenge very well despite hot weather conditions. ECMP President Dmitry Svatkovsky said: "This year ECMP achieved further growth in the activities of the Youth and Masters movement, which is a very positive step, proving the popularity of our sports among the people who love them and try their best to promote them. “The most positive discovery was the wonderful organization of the European Biathle-Triathle Championships thanks to Pierre Jande and his club. “Now we have a reliable organizer of Biathle-Triathle in the very centre of Europe - in Bavaria. 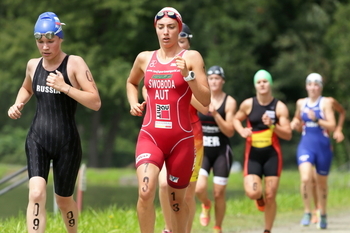 These championships took place in a picturesque recreation zone near the centre of Weiden with a natural lake, swimming pools, forest and a lot of people visiting the place." The UIPM 2018 Biathle-Triathle World Championships are taking place in Hurghada (EGY) from October 25-28 and National Federations can see the official invitation here and register teams for the Open Division here.